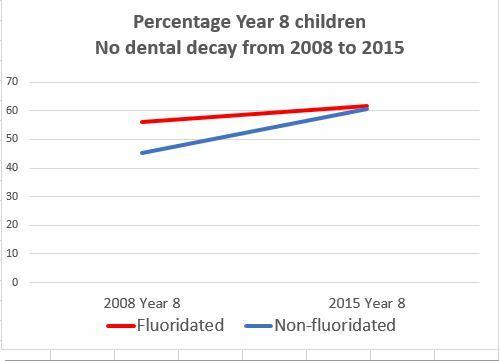 Despite claims by Health Minister Jonathan Coleman this week that fluoridation is the best thing since sliced bread, the latest data from the Ministry of Health shows there is no difference between fluoridated and non-fluoridated areas. 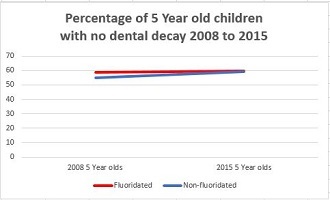 This is despite the fact that fluoridated data includes the most affluent area in the country, Wellington, and non-fluoridated data includes the poorest areas of the country such as Northland and rural East Coast. 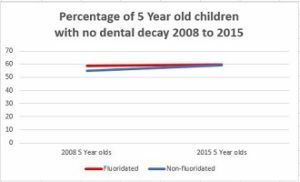 If this trend is allowed to continue, non-fluoridated areas may actually surpass fluoridated areas in terms of dental health.”No wonder fluoridation promoters such as Coleman, the Ministry of Health and the DHBs are desperate to fluoridate the whole country as soon as possible. 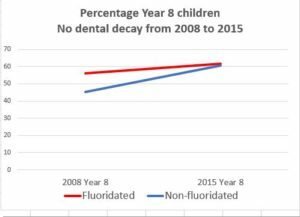 If they leave it any longer non-fluoridated areas will be doing better than fluoridated ones” says Mary Byrne, National Coordinator for Fluoride Free New Zealand. The Government is currently progressing a Bill to shift responsibility of fluoridation from the local councils to the District Health Boards. Jonathan Coleman says there are “35,000 children under 5 having teeth pulled out of their heads last year”. He fails to mention that half of these children live in an area already fluoridated. Note: If you would like a copy of our spreadsheet for the above graphs, please reply to this email to request a copy.